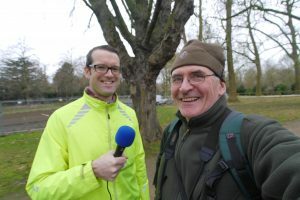 Today I did an interview with David Webster of BBC Radio Cambridgeshire about the Mistletoe survey. 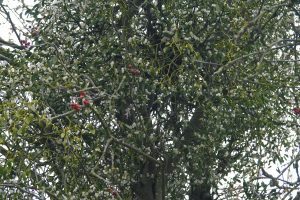 We are hoping to get lots of records of mistletoe growing wild in the city and by publicising it on radio, we will hopefully encourage people to report their sightings. The Mistletoe hotspot seems to be at the junction of Madingley Road and Queens Road. There are quite a few good bunches mostly growing in lime trees. As you go up Madingley road there are some trees that are heavily covered and must be suffering from the burden. This one is a Hawthorn tree outside Churchill College which has a huge Mistletoe growing in the centre of the main branches. 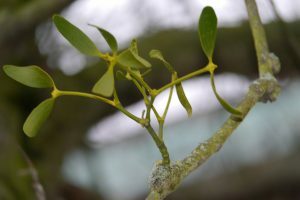 This is obviously a female Mistletoe, as the male doesnt have berries. Here is a rather more diminutive male plant, showing the haustorium, where the stem of the Mistletoe fuses with the branch of the tree and the modified roots penetrate the host tissue to obtain water and minerals.